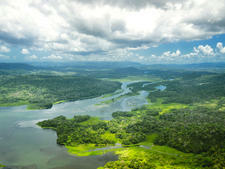 If there was ever a country created for eco-tourism, it is Costa Rica. Effectively a biological corridor between North and South America and with its neo-tropical climate and rainforests acting as a sort of biosphere, it now has one of the greatest biological diversities in the world. Nearly a quarter of its landmass is designated as national parks and it houses 8,000 species of plants, 859 species of birds, 10% of the world's butterflies and as many snakes as you could shake a stick at. Costa Rica has also -- rare for the region -- been a peaceful, democratic country for a century or more. Abolishing all its armed services in 1949 to spend the money on improving social, medical and educational facilities has helped in this and also won it Nobel Peace prizes, not to mention UN-underpinned eternal neutrality from 1983. It is not crime-free, though, so it still pays to take care in its towns and streets. However, it is one of the most relaxed and welcoming places to visit in Central America, and Puerto Limon is well-located for its best eco-tourist attractions. In the busy cargo port of Limon, where tour coaches jockey for position with fleets of lorries bringing continuous loads of Costa Rica's major export: bananas. A temporary open-air welcome stand, with a list of taxi fares and other tourist information, is set up right by the pier where your ship is docked. Another 100 yards on there is a small group of individually-covered craft and souvenir market stalls right outside a distinctive green terminal building. Walk through this -- past a bizarrely-sited beauty salon with its own pedicurist and chiropractor working in full view -- and out the back door, and you'll find yourself in Limon straightaway. If you have time between tours, Limon is worth an hour or two. There are some interesting shops and a good museum (Etnohistorico -- open Monday through Friday, 9 a.m. - noon and 1 p.m. - 4 p.m.) right next to the post office on the same road as the bank and park, Avenida 2-Miguel Velasquez, but about a 10-minute walk to the left of the terminal. The rain. Sometimes we forget the connection between the rain forest and rain -- you really can't have the former without the latter. Over the year, parts of Costa Rica have as much as 26 feet of rain which is why seasons are described as "rainy" and "not so rainy" on its Pacific coast and "rainy" and "rainier" on its Caribbean side. Chances are you will see some liquid sunshine during your stay -- if you don't want to get your hair wet, pack a hat. There are buses from Limon to places like Cahuita ($1 each-way), Moin (50 cents) and even to the capital San Jose, more than 100 miles away. These leave from the bus terminal, which is a five-minute walk further down Avenida 2 from the museum. If your ship is in for the usual 9 a.m. - 6 p.m. day, taking the bus to San Jose is not a sensible option. The journey takes three hours each way, which leaves little time there, and traffic jams could delay you and cause you to miss the ship. Even the one-hour Cahuita journey is a risk as the buses only run every two or three hours. The same applies if you hire a car from the desk in the terminal -- the roads are just not that good in Costa Rica and traffic delays are a constant problem. More reliable (because you don't have to wait for one) and still a relatively cheap method of transport are the red taxis which can be hired at the dockside or by the terminal -- although a trip to San Jose, which has little more than a decent museum, pretty cathedral and lively central market to recommend it, is still probably not worth the hassle and expense. Although the taxi fares are posted (for example, $20 to Cahuita), these are all negotiable. Their drivers' English is patchy so, if you are looking for a guide as well as a driver, check this first. It is definitely worth taking the short (three-mile) trip to Moin where you can hire a boat along the Tortuguero Canals. There is an entrance fee and extra charge for a guide as well as the boat hire for independent visitors but, on this critic's recent trip there, passengers paid $50 for return taxis and boat trip for two compared with the approximately $92.50 per person cost of the ship's tour (which does include a buffet meal). There is also a desk for local tour operators (Caribe Tico, Blue Limbo, Mambo Tours) within the terminal. 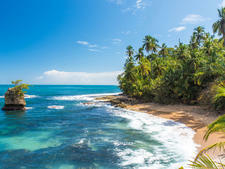 They offer alternatives to the ship's tours to the Cahuita Coastal National Park, Tortuguero Canals, Rain Forest Aerial Tram as well as a two-hour Limon tour and an eight-hour trip to San Jose. There is also a range of more active trips, including horse-riding, watersports, and canopy tours. Costa Rican currency is based on the Colon but US dollars are widely accepted, while credit cards are taken in the larger shops and most hotels and restaurants. 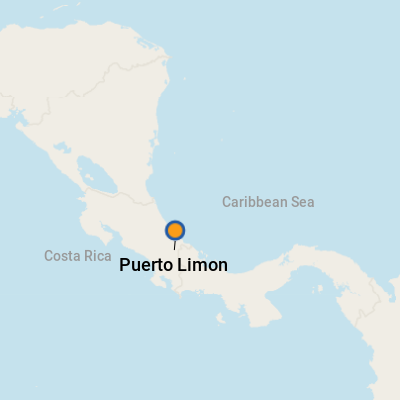 There are no ATMs in the cruise terminal but there are several international banks in the town of Limon -- the closest to the port is just 400 yards away, across the road from Parque (Park) Vargas: Banco de Costa (9 a.m. - 3 p.m.). The official language is Spanish but many Costa Ricans know some English, and those working at tourist sites usually speak it well. An ongoing influx of other nationalities -- from Jamaican to Chinese -- has created a variety of influences on the dishes served in Costa Rican restaurants. Look out for Food Soda (small restaurants) serving favorite local meals of casado (rice, beans, stewed beef, fried plantain, salad and cabbage); Gallo Pinto (pre-cooked and seasoned rice and beans with eggs, sour cream and a soft corn tortilla); Sopa negra (black beans and poached egg); and picadillo (meat and vegetable stew). Other, more international-style restaurants (often in hotels) in Limon and nearby Moin serve good seafood among other more recognizable dishes. A bag or two of its super-strength coffee would be the obvious suggestion but this is one place where memories -- of the rich diversity of plant, bird, marine, and wildlife -- will be the best souvenirs of all.